Just tried out the new FallenSword Legendary Set, the Cu Sith Set, which is a Lv 150 set. This set is what we called a "Suicidal Set", which contains of only Attack and Damage, but no Defense, Armor and HP. 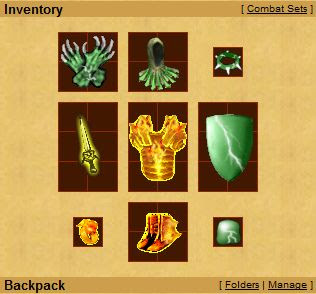 With this set on, unless you get a exceptional high Armor item with the other components, or else you will be rather low on armor. That's why it is suicidal, either your opponent die in 1-hit, or else it is you who die. If you are a risk player, this can be quite a nice set, as this is the only set at around Lv 150 which provide 1-hit except the Santork set which was out last Christmas. We offer you the worlds most top ten games and gaming accessories. We have our own biggest gaming website. No search need for top ten games and gaming accessories,you can find all information click here.